TORONTO, ON – Mill Street Brewery has announced details of the latest edition in the Mill Street Seasonal Sampler series of mixed six-packs. The 2016-17 Winter Sampler features four year-round brands – Organic Lager, Tankhouse Ale, 100th Meridian Lager and West Coast IPA – along with a pair of seasonal brands. The first brew was a disaster with the entire mash dumped onto the floor and shovelled into bins for cow feed. Rye gels and when it gels in your mash it makes the mash really slimey and water tight and you can’t rinse the sugars out. There was a lot of bad language used during that first brew, but we learned a lot and the second brew (which took two days instead of the usual 8 hours) went better and then the ones after that were manageable. We were so mad at the first brew that we called it Schleimhammer in German which means literally “Slime Hammer” because the mash was SO gummed shut that it was the only word we could think of in German to describe the thing! Bob’s Bearded Red is brewed with a blend of imported and Canadian malt and hops including Chinook hops from Prince Edward County to give it a beautiful balanced palate with a kiss of spice from this classic North American hop. Nitrogen-charged for classic pub draught creaminess, this amber beauty is true Canadian craft set on a global stage. 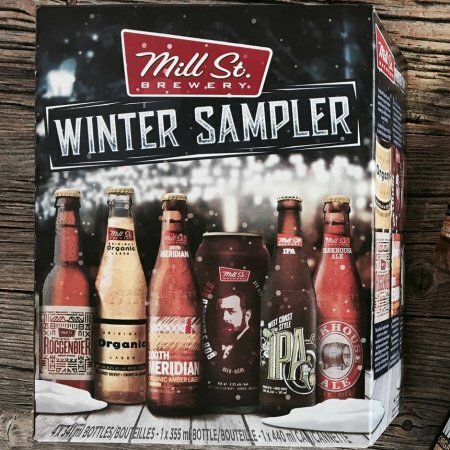 The Mill Street Winter Seasonal Sampler is available now LCBO outlets across Ontario, retailing for $14.15 per pack.